Too often, the descriptions of urban form are reduced to excessively simple binary classifications (city v. suburb), or rely on data grouped by counties, which are maddeningly disparate units. County-level population data is bad at telling us much of anything about cities and housing preferences. Counties just contain too many multitudes – of built environments, of types of neighborhoods, of zoning regimes – and vary too much from place to place to be very useful in cross-metro comparisons. It is possible to build a much more fine-grained and nuanced picture of the contours of urban areas, looking at variations in population, educational attainment, race and ethnicity and poverty as they vary across the landscape. One of our favorite examples of this kind of high-definition statistical analysis is Luke Juday’s “The Changing Shape of American Cities,” published by the University of Virginia’s Cooper Center for Public Service. “The Changing Shape” includes a traditional PDF report, which emphasizes the emergence of what writer Aaron Renn has called “the new donut”: a wealthy core, surrounded by a ring of relatively low-income outer city neighborhoods and inner suburbs, surrounded by wealthy outer suburbs. That, of course, is very much worth reading. 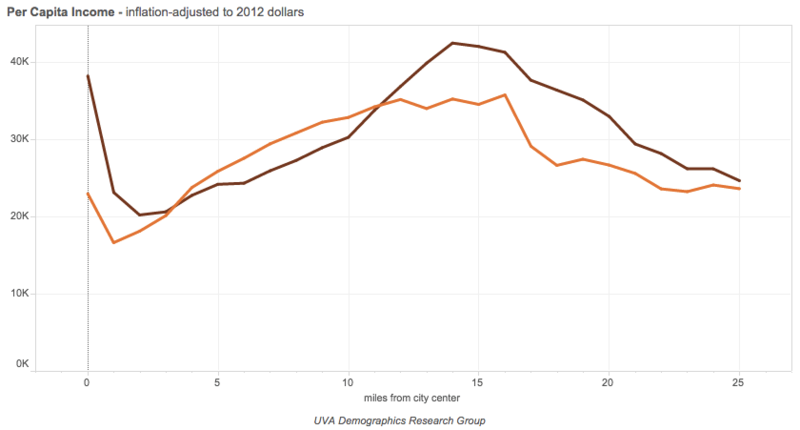 The purple line shows the data from 2012; just as dramatically, the orange line shows the data from 1990, back when American cities followed the “old donut” model: a poor inner city and wealthy suburbs. What’s so valuable about this presentation of metropolitan data – as opposed to county, or even municipal, based analysis – is that it doesn’t require the historical accidents that are government boundaries to correspond with subtle and ever-changing social and economic geography. By simply showing what happens to, say, the proportion of residents living under the poverty line as we move mile by mile through a metropolitan area, we get a much better sense of a region’s shape than we do by drawing a handful of sharp lines and measuring how many people fall on one side, and how many on the other. Juday’s work even gets past some of the issues of more sophisticated approaches to urban categorization. For example: Trulia’s Chief Economist, Jed Kolko, recently made an urban/suburban distinction based on whether most housing units in a given neighborhood were in multi-family or single family buildings. In America’s biggest, densest cities, that makes a lot of sense: most New York- or Chicago-area neighborhoods where most people live in single family homes are probably not considered very “urban” there. In other words, it’s mostly single family homes. But it’s also centrally located, and, in the Memphis area, is popular specifically for its centrality, relative density and walkability, and other “urban” amenities. Kolko’s criteria, though they sound perfectly reasonable at first blush, mischaracterize the role Midtown plays in Memphis – and the role that many other similar neighborhoods play in their regions across the country. 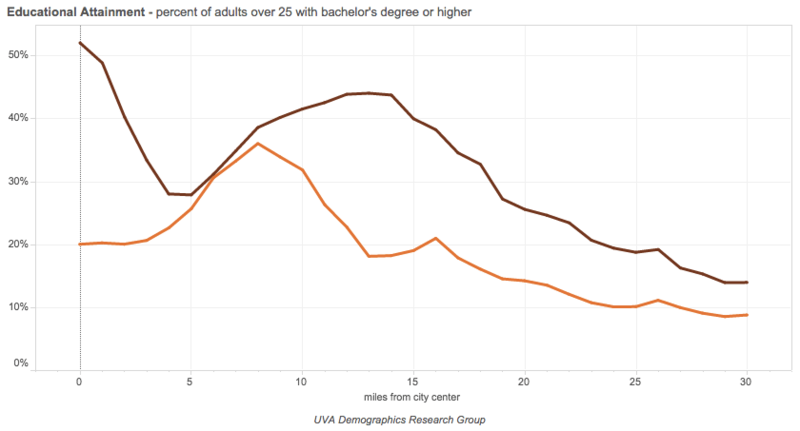 Juday’s charts, on the other hand, easily register Midtown’s popularity among the young and well-educated as a close-in neighborhood. Of course, no form of analysis is perfect. One thing that you can’t see in these visualizations is the phenomenon of the “favored quarter.” That is, demographic patterns tend not to form perfect concentric rings around a city center: more often than not, they’re a composite of rings and wedges, beginning downtown and moving out in one direction. That, too, has been well-presented by Radical Cartography, among others. This map from Radical Cartography shows per capita income in Atlanta. The wealthy (pink) favored quarter is clearly visible to the north. But that is a relatively small issue. “The Changing Shape of American Cities” is an excellent approach to urban demographics, and the fact that the data are publicly available to play around with in an interactive display means there should be many, many more insights to come from Juday’s work.